Monemvasia in Greek means having only one entrance. It’s also the name of one of the most scenic and historic islands in the Peloponnese area of Greece. Momenvasia is a steep, rocky place that resembles the more famous island of Gibraltar, far to the west. It sits just offshore, having separated from the mainland during an earthquake in 375 A.D.
For hundreds of years, it was accessible only by sea. Early settlers built a town during the Middle Ages on the island’s south face where they would be invisible to passing armies. Considered impregnable, the island allowed its residents to live peacefully for hundreds of years. The only resource the islanders lacked was fresh water, which had to come from the mainland. That lack led to several successful sieges that brought first Venetian and then Turkish culture to the island. Today, a narrow concrete causeway connects the island to the nearby Greek town of Laconia. Most of its ancient buildings have been renovated into shops, restaurants and small hotels to serve the growing number of savvy travelers who have discovered Monemvasia again. Many of the island’s homes also offer B&B style romantic suites for travelers. Walking the narrow streets is like a passage back in time. Wide enough only for foot traffic and donkeys, they wend their way through the small town and then lead up a steep climb to the medieval castle that still stands on the cliff at the top. The climb is worth the walk if only for the stunning views from the castle out over the Aegean Sea and the island of Crete in the distance. 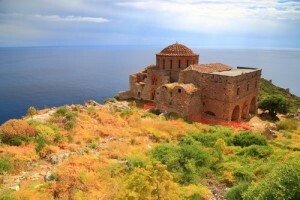 Since Monemvasia has become more popular in recent years, an area called New Town has grown up on the top of the island near the castle with modern hotels and accommodations. Nearby is the 13th century Church of Elkomenos Christos and the 12th century Church of Agia Sofia, both of which have served as houses of worship for various religions over the centuries. There are several beaches on the island within walking distance of the town. Some cater to tourists with chaises and umbrellas available; others are just secluded coves. All are kissed by the warm waters of the Aegean. 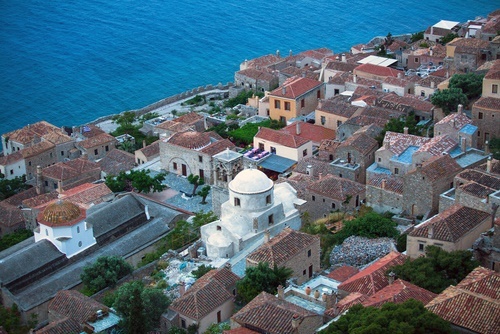 Speaking of warm, the weather on Monemvasia is in the 80’s year round. Perfect for anyone looking to escape the rigors of winter in other parts of the globe.